One of life’s minor joys is finding someone to admire. Not many heroes are left to us, thanks to the mainstream press ignoring instances of quiet, sustained courage, and our own cynicism. I’m sometimes annoyed at ‘positive’ news that translates into interviews with students who have managed high scores, or interviews with successful businessmen or creative professionals. There’s nothing wrong with that, of course, but there’s a difference between success and heroism. We rarely hear about those who take a stand — unless they end up being jailed or tortured or killed for it. And then we begin to wonder if there is anybody at all who takes a stand, and whether it is worth it. And if nobody does, why should we? So I was pleasantly surprised to discover that Shyam Benegal and Gul Panag had withdrawn from the jury of a filmmaking competition organised by Vedanta. I looked it up online and saw that lucrative prizes were being offered to media students. But the thing is, Vedanta’s money is not made through films. It is made through mining, mostly in rural areas and forests, and a lot of Vedanta’s activities and plans are protested by those who must suffer the consequences. Vedanta wanted to create happiness, not by tackling pollution but through a film competition. It chose jurors like Shyam Benegal, Gul Panag and Piyush Pandey. Last I checked on their website, only Pandey’s name remained on the list. And I feel relieved, not because I want to see Vedanta criticised, but simply because I get hungry for the lack of an artist whom I can also admire as a person. 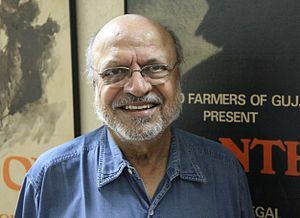 Benegal has long been a hero for many of us who like his artistic vision, and respect his engagement with the political, moral and social forces shaping the country. After lawyer-activist Kamayani Bali Mahabal wrote an open letter on her blog, telling him about Vedanta’s reluctance to take responsibility for pollution and displacement, a friend of Benegal’s left a comment saying that the filmmaker has withdrawn from the jury.